combined with a magnificent sketch by the fabulous talented Em Stafrace. 'TODAY & TOMORROW AND FOREVER '. one of my favourite memories is the Blues Festival at Byron Bay. We often take a spontaneous Romantic getaway and stay at a B & B in the Adelaide Hills . we recently celebrated our 43rd wedding Anniversry on January 24th 2013 . Wowwwwwwwwwwww! This is GORGEOUS! I love love love the colors, the distressing, that photo of the two of you and loveeeeeeeeeee all the goodies on here!! I love this page wonderful work! This is such a beautiful photo of the two of you, and the LO is another winner!! Heather, this is just devine. Those colours and details look amazing. A fabulous photo of you both too. Firstly I love the photo and the journaling. The layout is amazing as always and I never tire of looking at your pages. Congrats on the 43rd anniversary. This is lovely LO and I really like the embeliishment cluster in the middle of the page. Man! Over FIFTY years... that's pretty amazing. It'll never happen for me - married too late to too much an older DH...but I applaud you guys....& what a stunner of a LO to celebrate that connection.....just perfect couple colours!!!!!! I have no words to describe my feeling ! This is fantastic ! Wow Heather this is simply gorgeous in every way! The colors look fab and the pic is perfect!!!!!!!!!!!!!! Oh gosh that cluster of embellies is just breathtaking! 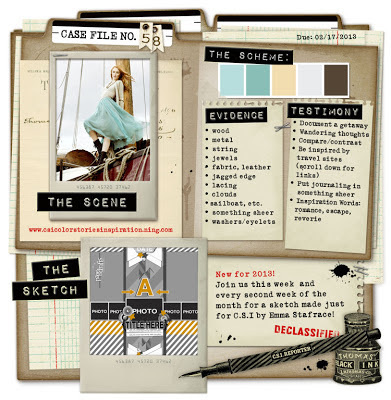 I love the way you interpreted the sketch and what you did with your chipboard! Inspirational!